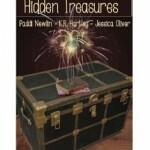 Hidden Treasures was a nice pick-me-up kind of story. The characters and situations were definitely identifiable. It was easy to get immersed and follow along. If I hadn’t found FlyLady, I would not have been able to do all I do today. Thanks for sharing this story. After downloading onto my Kindle, I breezed right through this lovely story and it helped me jump right back into my FlyLady routines (just in time to bring a little order into my home for the holidays). I love the way FlyLady routines free up more time for peace and enjoyment of family and friends. Thank you to the author for sharing two lovely FlyLady success stories. Taking baby steps and FLYing in Woodland Hills, CA. We love reading your Hidden Treasures reviews! Do you have one of your own? Send it to us at FlyLady@FlyLady.net with “Hidden Treasures” in the subject line and yours might be the next one featured! This entry was posted in testimonials and tagged flylady, get organized, Hidden Treasures, Sink Reflections. Bookmark the permalink.